Villa Olivade is a one-bedroom Provençal villa situated on the beautiful, privately gated, Domaine du Piol. Domaine du Piol's elevated position gives it unrivalled views to snow capped mountains and the sea. The villa benefits from the sun starting in the early morning and throughout the day until it sets directly in front of the west facing balcony. Throughout the day, you can enjoy the sunshine and views from either the balconies, the terrace or the sun deck. All of which are on different levels and all offer those essential, amazing views of the Cote d’Azur. The balconies, large terrace and lower garden area are all private and exclusive to Olivade. No other property on the domaine offers the same amount of privacy or views. The terrace has a large shaded Pergola with seating for 4 persons and garden lights mean you can eat late into the evening. Multiple adjustable wooden sun-beds on the terrace can be used for sun bathing or walk down to the lower sun deck which sits amongst palms, bamboo and grasses and is also equipped with adjustable sun-beds & parasol. Villa Olivade Features: The villa is beautifully appointed and decorated throughout with stylish furnishings, marble bathroom, super-king wooden bateau-lit bed, quality kitchenware, air conditioning and WiFi. You have a choice of areas for dining either inside or out including either our balcony on the top level or beneath the pergola on the terrace. There are many pretty spots to sit outside in the gardens and enjoy a glass of wine all offering different views either to the sea, mountains or surrounding area and villages. There is a large, shared swimming pool on the Domaine with views to the sea and the Mountains. Parking is right outside the villa. The parking is covered which is essential in the summer. St Paul de Vence: The Medieval village of St Paul is just a 20 minute walk or a 5 minute drive away. Here you can stroll through the cobbled streets and enjoy some of the finest art available or watch petanque being played by the locals whilst enjoying a drink in the Cafe de la Place. Opposite the Cafe de la Place is the famous Colombe D'or. Voted one of the top 10 restaurants in the world, the Colombe D'or has the largest private collection of artwork in the world from Piccasso as well as work by Matisse and Renoir. Although a regular haunt for the rich and famous, the staff of the Colombe D'or makes everybody feel welcome. An evening walk around the ramparts is recommended to catch the amazing sunset and see the swallows fill the sky. If you prefer, you can enjoy the same sunset from the villa! The Côte d'Azur: The A8 which runs along the Cote D'Azur is just 10 minutes from Domaine du Piol and is your fast track to the most famous coastline in the world! Destinations such as Nice are just 15 min, Cannes 30 min, Eze 25 min, Monaco 30 min, Menton and the Italian border 35 min, .... the list goes on. Heading out beyond Saint Paul there are many beautiful villages such as Vence, Tourette Sur Loup, Gordon and Grasse as well as famous institutions such as the Maeght Foundation, Ville Emprussi de Rothchild and National Parks like the Mercantour and Massif de l’Esterel. Sally and I have been in love with the Côte d'Azur since the mid-'90s. We first went with EasyJet using tokens collected from a national newspaper! Before I met Sally I used to ride my motorcycle to Bandol for the big event in the motorcycle racing calendar The Bol d'Or. Bandol was a place I loved and hoped that one day, I would live there also. The plan was simple. The area was to be in or around Bandol. The property to be manageable with NO RENOVATION. We ended up 150 Kilometers away standing in a property signing papers with rain coming through the roof and looking out of the broken windows and shutters. But. What a view! 2 years later, (after a lot of hard work) we had a property we could actually use! The first thing that hits you is the view. There is no other property on the domain that has such a magnificent view to the sea and the surrounding countryside. In fact, only St Paul itself has the same views. That view can be enjoyed from the balconies, the terrace or the lower garden. Each area offering a different aspect. There is always something to see. According to Google maps, the view to the west is up to 40 kilometers and takes in Cannes as well as the mountains of L'estoril. The location is ideal for exploring the region and is centrally located between Nice and Cannes. St Paul is a pleasant 20 minute walk or 5 minutes by car. Don't just visit the famous costal resorts though. Point your car the other way and drive into the mountains to visit hill top villages and mountain streams. Not enough people in my opinion explore 'the interior' as it is called by the Azurians. I don't think they tell anyone actually. They keep it to themselves! Whatever you decide to do, there are so many wonderful places that you would need a month just to see a fraction of what this area has to offer. We always offer all our guests help and advice to plan their holiday. Sally and I lived in the villa for 6 years and have good knowledge of what to do and where to go to get the most from your stay. The bathroom has twin basins set in marble. Above the basins is a full width mirror. There is plenty of cupboard space under the marble top for all your items. A hair dryer and quality towels are provided. The large shower has plenty of room and mixer taps to get the temperature exactly as you like it. There is also a Bidet. The main living area and bathroom are both fitted with Air Conditionng units that also act as heaters. The property is heated throughout and complimented by Air Conditioning Units that can also provide heat. All bed linen is provided and there are spare blankets and pillows if you need them. We also supply towels in different sizes, beach towels and quality bathroom robes for your convenience & comfort. We have a new high quality Philips Washing Machine with a large capacity. It runs very quietly and being new it is very efficient with a good high speed spin. There is covered parking right outside the villa. High speed internet with Fibre arriving soon. All towels are provided including beach towels to use by the pool or in the garden. We also supply quality bathroom robes for your convenience & comfort. The living room has a large sofa, coffee table and a large HD TV. The French windows open onto the balcony. The Bosch dishwasher is a silent running and efficient. As well as a built in fridge/freezer in the kitchen, there is a family sized refrigerator in the Cave on the terrace. Perfect for keeping your drinks cold and within easy reach! Ceramic hob with 4 stations and built in timer. New high quality large Gorenje Fan assisted oven with grill and timer. There is a high quality coffee machine as well as decanter. Large toaster that can take a slice of baguette. There is a large selection of various utensils that should cover every occasion. There is internet TV with English Channels. There is a large selection of well known films on DVD. A selection of books left by us and guests. The lower garden is very private but with spectacular views to the coast. There is a bicycle available which is fitted with a rack and panniers. This can be used to go to the shops rather than a car or for a ride into the PréAlpes behind St paul de Vence. There are 2 balconies. One facing South to the sea and the other facing West to the mountains. There is a large terrace with a pergola and dining area. Please see the picture gallery. This villa felt like home. It was beautifully appointed in the provencal colors. The bed was comfortable. The kitchen well stocked with even paper towels etc. There was alot of helpful information from the owners and they answered any questions almost immediately. And the view was spectacular. Though St. Paul de Vence and a large modern mall were nearby, it was necessary to drive, for us. That was our only complaint and not with the owners. Many sites were nearby such as Antibes, Grasse etc. A very lovely stay. Would love to be there in the summer and use the lovely terrace, garden and pool. Hello Craig and thank you very much for your review. Of course we hope to have you back soon to Olivade in the Summer! To see the Côte d'Azur ideally you need a car. However, There is an excellent train service that runs along the coast and into Italy making a lot of places accessible without a car. We have also successfully used Uber for local trips as well as when we arrive at our destinations. The Uber service is also competitively priced and so easy to use. It does make a viable alternative to hiring your own car. Villa Olivade is a magical place! We had an amazing 5 night stay at Villa Olivade! Everything was perfect from the views of the lovely countryside to the sea in the distance. The villa was perfectly situated for either exploring the coast or the inland areas. The villa was well equipped and furnished. Sitting outside in the garden patios was one of our favorite past times, very peaceful and quiet. David and Sally were a delight to deal with. And, their attention to detail was extremely helpful. They were extremely responsive and helpful when we had questions. Thank you David and Sally for letting us experience your dream! Hi Cynthia and thank you so much for your review. It was a pleasure to have you stay at Olivade and we really hope that one day you will be able to return and bring more sunshine with you! We are just back from 2 ideal weeks at Villa Olivade and still very enthusiast. Booking the villa was very easy as David and Sally-Anne have been very informative, helpful and always quick to respond to any question or request. The location is ideal if you want to visit the region…..Antibes, Monaco, Menton, Eze, Tourettes sur Loup, Nice…..etc. The elevated position of Domaine de Piol gives an amazing sea and mountain view. The villa is very well furnished and everything is there to have a comfortable stay. Hello Phillipe and thank you for your review. As always, Sally and I are happy to hear you had a great time. I also hope the cycling routes I supplied for you in GPS format were enjoyable! Hello Elaine and thank you for your review. It was lovely to have you stay and of course you are always welcome back! 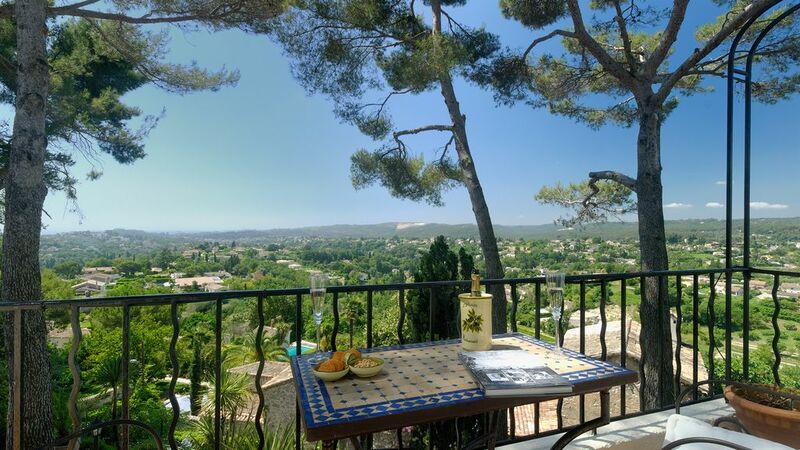 We book 2 or 3 rental properties a year in different places, however an annual trip to the South of France has become established these last few years. We usually find it difficult finding a good quality property for 2, with outside space and a pool, and often end up having to book (and pay for) a larger property than we need. Domaine du Piol has been a real find - this is our 4th stay, and our second in Villa Olivade. This is our favourite due to the open space it provides on 3 levels as it’s built on a hillside, with 180° views to the south and west so it gets the sun on one of its terraces all day. The villa itself is furnished well and everything is provided. There’s every kitchen utensil to cater a gourmet meal, although our holiday cooking is more of the cold meat/cheese/salad/baguette supper after a nice lunch in one of the excellent restaurants nearby. Then it’s lovely sitting on the balcony with a glass or two of wine watching all the lights come on and the stars twinkle. The bedroom is also well furnished, with a very comfortable bed, and plenty of storage for clothes etc. The communal pool is very large and well kept. In late July there were only a few people in there; we’ve also been in August when it was a bit more crowded but still able to find a couple of spare sun beds. Hello Jane and thank you for your review of Olivade. It is always a pleasure to have you stay and I hope that you can come again next year. Thank you Sylvain for your review. We are glad that you enjoyed your stay and that you looked after our villa and plants so well. We hope that one day you will be able to return to Olivade. The Côte d'Azur is like no other place in France. There is a remarkable beauty in its offshore islands, hills and coastline, the scent of the plant life, the mimosa blossom in February and the impossibly blue water after which the coast is named. The Côte d'Azur remains undeniably captivating. Every time there is a gap in the hills, the skyline is dominated by the French Alps. The white capped mountains against the blue sea and the surrounding countryside is something every one should have the privilege of enjoying. The Côte d'Azur really does cater for all tastes. Ski: The nearest resort to St Paul is Gréoliéres which is just a 35 minutes drive away. Although just a small resort, its location close to the coast means it is a popular visit for a quick morning's ski followed by relaxing on the beach in Cannes in the afternoon. Gréoliéres also has the best cross country skiing (ski du fond). There are about eight courses up to 11km long to suit beginners and experts alike. For larger resorts, you need to head towards the Alps and go to either Valberg, Isola or Auron. These three resorts are less than 1 hour 15 min to get to and offer all levels of skiing. Isola offers the biggest variety. Auron is the prettiest and Valberg fits nicely between the two. Further into the Alps and the choice of resorts is vast. The changeover & linen fees are INCLUDED in the prices above. We recommend that you use the payment service provided by this holiday website which has a Book with Confidence Gaurantee In the Summer months, we rent on a week by week basis (7 days, 14 days etc.) and the changeover day is Saturday to Saturday but please talk to us if you have other date requirements. We are flexible and will always try and accommodate where we can. A 50% deposit is required to confirm a booking and the remainder needs to be paid 60 days before your holiday along with a refundable security deposit of £300.00. The deposit will be returned within 7 days. We understand that circumstances can change so we have a very fair refund policy. Please see our Terms & Conditions for more details. Taxe de Sejour is levied by the Commune of St Paul de Vence. The cost is €2.30 per person per night. This can be paid in advance or left in the villa when you leave. More information about tax de Sejour can be found on the official St Paul de Vence website. If you have any questions or queries about any of the above, please just contact us so we will help you.